Twitter, while still my favorite place to connect with members of my PLN in order to learn, share, and network, is not necessarily the most conducive environment to discuss complex issues. It’s easy for one (or several) Tweets to come across in a way that does not fully encompass the feelings of the poster. I feel like I need to elaborate on my views on the AASL session selection process more, as some feel that the reason I am raising concerns is that I have sessions that weren’t accepted. Of course I wanted to have a session accepted, otherwise, I wouldn’t have submitted a proposal. I still have a session that is part of the “crowdsourcing” process, so again, that is not why I am questioning the process. Four years ago at AASL 2015, I questioned the process of blind review, and my opinions on the matter are still the same. AASL uses a blind review to evaluate session submissions. I understand the intent of this is to be fair, but I argue that this fairness does not equate the best possible session selection. Taking a presenter’s past work into account seems logical to me, and it is done at many other large and small conferences. Questions that would provide relevant background information on sessions include: Have you published content on this topic? Have you presented at your state conferences on a similar topic? What resources or mentoring have you shared with other librarians to promote this topic? Providing evidence that you are equipped and knowledgeable to present on a topic at a national conference makes sense to me. As librarians, we teach our students to critically evaluate sources by examining the credentials of the author. It makes sense that organizations would approach session selection for a national conference in a similar way. Many librarians (myself included) pay their way to national conferences, taking valuable days away from their students and libraries to participate. An organization should do everything in their power to ensure a balance of sessions from quality presenters so attendees get the most out of their conference experience. We have all attended sessions where the description does not align with the content delivered or where the presenter is unprepared, and a national conference should do everything in their power to buffer the possibility of that happening. By no means am I saying that having presented successful sessions at a past conference should guarantee you a slot at the next conference. Again, though, it would seem logical to me to take into account session evaluations on a presenter if they have presented at that conference before. I think reaching out to state affiliates for recommendations on sessions that were largely successful and had great feedback at state conferences would be meaningful and wise. I do everything in my power to drive my school’s library program with the data and feedback I collect from my students and faculty, and I would expect my professional organizations to take a similar approach. What is AASL’s intended outcome for the conference sessions? It has been stated numerous times that reasoning behind the current process is to give new voices an opportunity to present. I applaud that goal and want to see it happen. Whenever I am speaking at a conference, I always seek out new voices that I can connect with, learn from, and amplify in any way that my platform allows. That is how we all learn and grow professionally. I think if the goal is to promote new voices, AASL should be intentional about it. The same goes for including diverse voices; if that is something that AASL aims to focus on (and I 100% agree that it should be) then be intentional about it. Look at data from past conferences — how many first time presenters were there? Not enough? Set aside a certain percent or number of sessions for first-time presenters and make it happen. Provide them with resources and maybe even a mentor to help make their presentations the best they can possibly be. Set them up for success with intention. Blind review doesn’t allow for this. It is great that AASL is willing to try new things in the selection process as they are crowdsourcing sessions this year. The way that the crowdsourcing has been presented, though, seems to me to go against the spirit of crowdsourcing. While I understand the intent of redacting all identifying information from session proposals, I disagree with it for similar reasons to those identified above. If you want to allow AASL membership and potential attendees to have a voice, let them truly have a voice. The way that the crowdsourcing was rolled out left many with questions of whether it was okay to promote their sessions within their PLN, but the spirit of crowdsourcing, at least in other instances that I’m familiar with, encourages exactly that. In no way am I looking to diminish the hard work of the conference planning committee this year or in years past. My hope is that there can be dialogue moving forward to assess the process for future conferences. I have been involved with conference planning on a variety of levels and understand the countless hours spent in preparation. I also understand that when you are so committed to a project, that criticism is difficult to hear — and believe me I’ve received my share of criticisms both directly and indirectly over the years. I know that all parties involved in this discussion just want the best for the association, conference, and our profession all around. However, this isn’t the first time that I have felt scolded or judged because I have questioned a situation or process involving AASL, leaving me questioning my relationship and value with the organization. After this whole exchange, I don’t like the way I’m feeling about AASL or the way that I feel like they’re feeling about me. This year, I’ve served as the President of the Louisiana Association of School Librarians and on the executive board of the Louisiana Library Association. If you know me at all, you know that I am a huge advocate for getting involved in your professional organizations. Our annual conference was last week, and serving as President meant I was involved in a number of events. 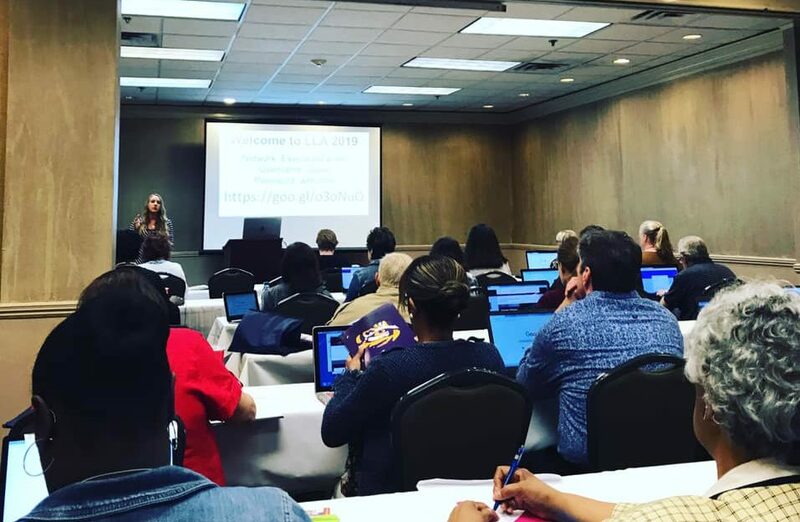 We kicked off the conference on Wednesday with a Google Tools workshop, where I was lucky enough to present with some amazing LASL librarians: Kim Howell, Stephanie Wilkes, and Chris Young. I shared my love for Google Calendars, Keep, and Hangouts. The best thing about doing a group presentation, though, is that I always learn something from the other presenters, and this session was no different. Like learning that you can type doc.new in your Chrome browser and a new Google Doc will pop right open. Mind blown! On Thursday, I was honored to moderate a panel for the Louisiana Teenage Librarians Association (LTLA). The panel was made up of several student leaders and their librarian sponsors who lead Library Clubs in their schools. LTLA holds an annual conference that is full of fun: book discussions, a guest author, contests, a talent show, and a dance. This group completely inspired me and I am so excited to shart my own Library Club and take the trip to the LTLA Conference next year! 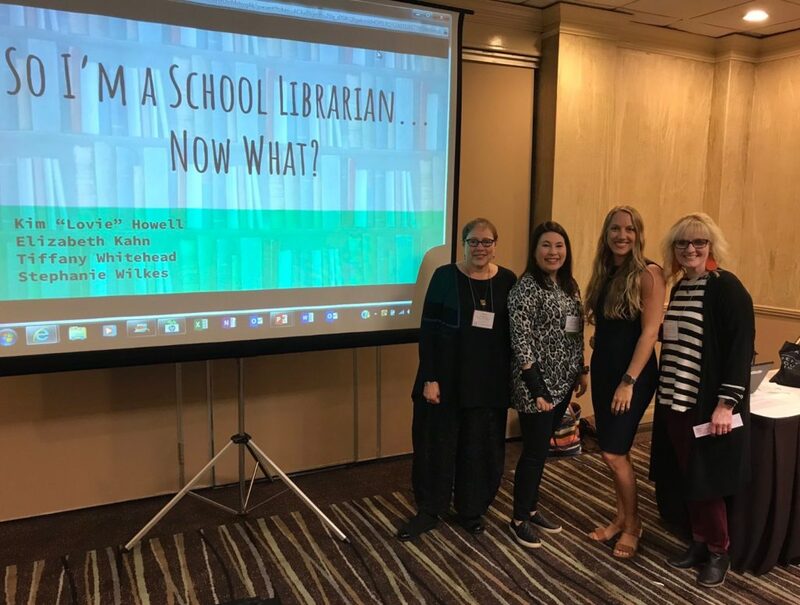 Again, it was such an honor to present with these amazing librarians that I admire and respect so much. We definitely went over our time on this session because there were so many amazing ideas to share and the audience got really involved with sharing their own ideas and experiences as well. When you’re in a room full of amazing librarians and have a chance to throw down some great ideas and library wisdom, you can’t help but leave feeling inspired and ready to take on new projects. We wrapped up the conference with our LASL Makerspace Lunch & Learn. This was new for us, as we typically host an author luncheon at the conference, but we wanted to try something new that would give attendees a chance to network and have some hands-on experiences. I did a Facebook Live video tour of our Makerspace Lunch & Learn, which you can check out below. I’m going to end by saying that conference planning is stressful for all involved, so be sure that you thank the people in leadership roles within your professional organization when you see good things happening. I also encourage your to get more involved with your professional organizations if you are not already. When we work together for the good of our profession, we all grow!